Delhi, December 26, 2013: As a result of the lobby campaign carried out today in the Indian Capital by 33 Tibetan women participants of the 4th Tibetan Women’s Advanced Leadership Training (TWALT), an undertaking of Tibetan Women’s Association (TWA), leading Indian politicians and advocates of Supreme Court of India signed the petition urging the Spanish Government and the European Union to stand up for Tibet and to maintain judicial independence of Tibet lawsuit from political interference. 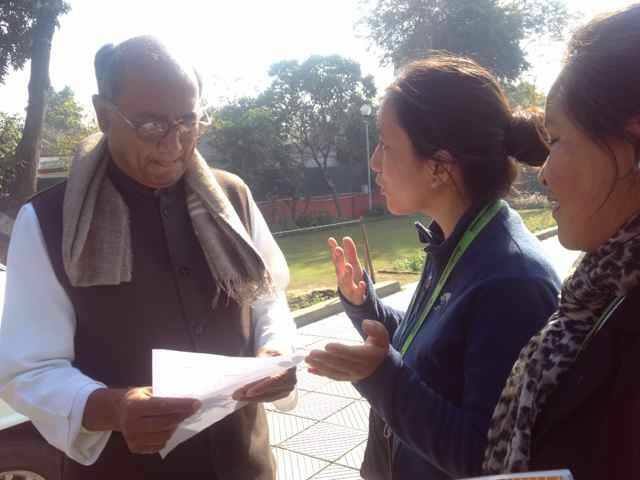 Influential signatories from the lobby campaign include: Shri Bhakta Charan Das, Lok Sabha Member of Parliament representing Congress party, Shri Inder Singh Nomdhan, an independent Lok Sabha Member of Parliament, Smt Meenakshi Lakhi, Politician, Lawyer and National Spokesperson for Bharatiya Janata Party (BJP), Shri Dig Vijay Singh, former Chief Minister of Madhya Pradesh and General Secretary of All India Congress Committee (AICC), Shri James Sangma, Member of Meghalaya Legislative Assembly, Chief Whip of Opposition and General Secretary of National People’s Party (NPP), Shri Manoj K Jha, Senior Leader and Spokesperson of Rashtriya Janata Party (RJD), Shri Jaydev Ranade, security and intelligence expert and former Additional Secretary, Cabinet Secretariat, Government of India, Shri Puran Mal Saini, Advocate, Supreme Court of India and Shri Ranbir Yadav, Advocate, Supreme Court of India. plan to limit the independence of Spain’s judiciary, in a move that could lead to a ground-breaking Tibet lawsuit, which implicates Chinese leaders, being shut down. 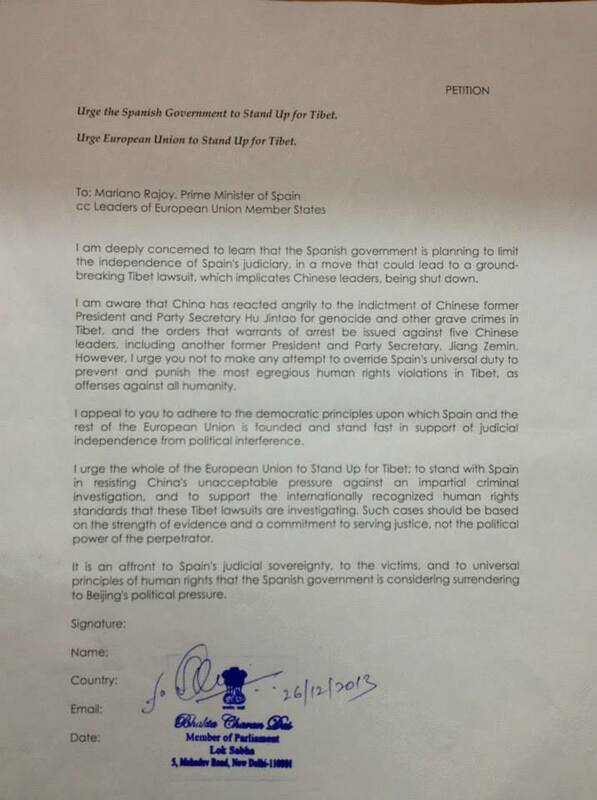 The petition reminds Spain of its universal duty to prevent and punish the most egregious human rights violations in Tibet, as offenses against all humanity. It appeals the Spanish Prime Minister Mariano Rajoy to adhere to the democratic principles upon which Spain and the rest of the European Union is founded and stand fast in support of judicial independence from political interference. 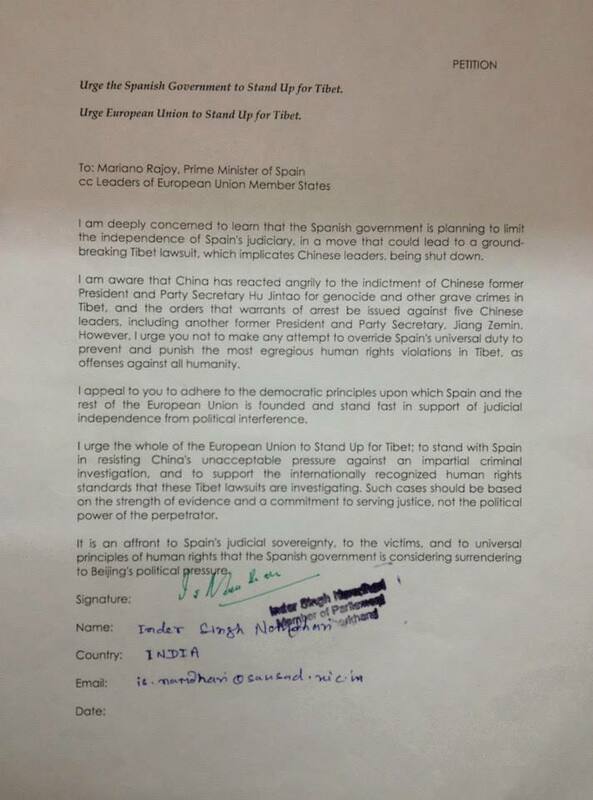 The Indian political figures, intellectuals and advocates joined the global call urging the European Union to Stand Up for Tibet and to stand with Spain in resisting China’s unacceptable pressure against an impartial criminal investigation, and to support the internationally recognized human rights standards that these Tibet lawsuits are investigating.